This past week has been a challenging week of fishing. Once again, nothing new for this fall. 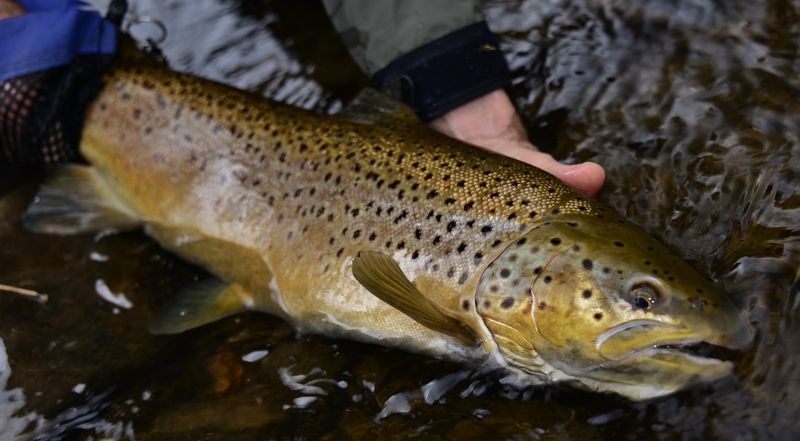 This time, low Water flows played a big role in the tough fishing conditions; we have been experiencing with our brown trout fishing. Despite the rain we received over the past week, water flows in all of our surrounding creeks and rivers in western New York remain low and clear. For now it appears that the brown trout run has stalled out. The only exception is the oak Orchard River; even here the pace of the run has slowed dramatically. I do suspect that we still have more Brown trout yet to come in to all our rivers and creeks, but water flows to need to improve first. The Salmon River, we finally head some decent rain hit the Salmon River watershed. As of writing this post the water release has been bumped up to 750 CFS. This water release has been long awaited. Fishing conditions should improve with the help of the increased flows. For now expect to have a strong egg bite in the upper river. With the increased water flows, all the stray eggs that have not been buried in the river bottom will be sent adrift, creating a feeding opportunity for the steelhead. Increase water flow can also pick up the pace of new steelhead entering the river. As always this time of the year covering water is important. Even in ideal conditions, Steelhead really run in large numbers. As a result we need to cover as much water as possible during our fishing day. Upper River where the fish are concentrated and there has been more salmon spawning activity, stay with the standard egg parents. Lower and mid river, steelhead Numbers will be more spread out, This is where swinging flies will be more productive, do to the fact that we need cover water efficiently. November dates 28,29, Open. 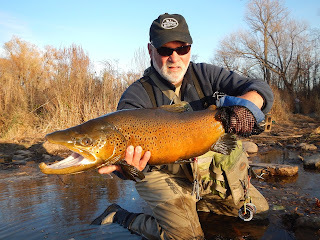 This is Brown trout and steelhead fishing. Note; Rick Smith, many of you already know Rick, Will be available to do trips on the Salmon River and the surrounding Creek for steelhead. Once again long days on the river. It’s been a while since my last update. Finished up my calendar for now, on the Salmon River. Not much has changed with the steelhead fishing. We needed to cover a lot of water for a few hook up. At this point, the egg bites in the lower river is about done. I have to say egg patterns are still effective, But there’s not a lot of eggs available to get the fish keyed in. For now the most productive technique is going to be swinging flies. There is not a lot of steelhead concentrated in any one location. Covering water with a spey rod and a swinging fly is the most efficient way to cover a lot of water. This is exactly what we need to do to fine a steelhead willing to take. Over the past week I have made my move back home to western New York. I am now fishing for the Lake run brown trout. Just before I made the move, we received a good shot of rain in the western end of the lake. This rainfall amounted to about 2 inches, with out this rainfall I would not be home fishing for brown trout. Water flow ware so low the fish could not entered the rivers. This means the Brown trout run in western New York got off to a late start. However once the Browns started to come in they made up for lost time. The past week was, the week of giant brown trout. The amount of 15 pound plus Brown trout we caught this test week was impressive. 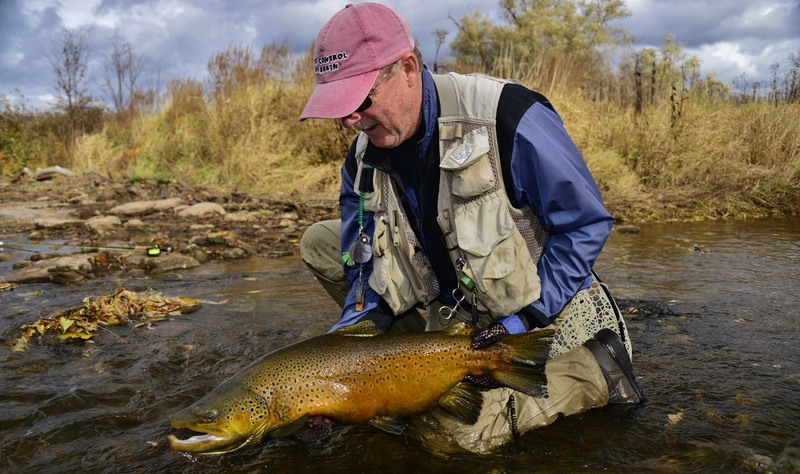 Once again water flows have become an issue and the trout size is becoming more normal. We need rain very badly or I suspect the brown trout run will stall out. 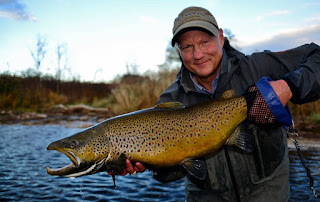 For productive flies; as usual when fishing for Brown trout in early November it is always an egg bite. Standard egg patterns are getting it done, Nuclear role bugs in Oregon cheese and orange, size 8 and10. Egg beaters, Orange, Chartreuse, size 10 Yellow are getting the job done in low clear water.